As Durga Puja is going on full swing and half way across the globe, I am sitting isolated from all the craze and madness going around Kolkata, to evoke a mood of festivity I have decided to busy myself preparing the festive foods, including Khichdi, Labda, Begun Bhaja, Luchi, Alur Dum, Radha Ballavi and many more for the next days till Bijoya Dashami, the last day when the idol of goddess Durga is immersed. 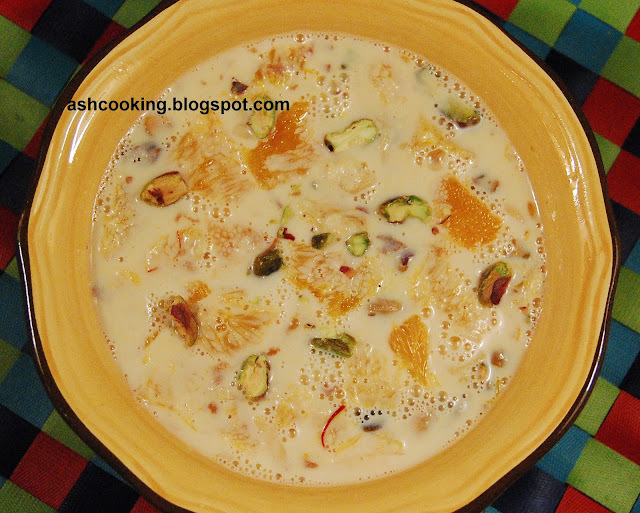 Kheer Kamala is a traditional sweet recipe of Bengal. Yesterday some friends were invited to our home for dinner; after the meal was consumed, everyone was offered a bowl of kheer kamala as dessert and I realized it winning everyone's heart the moment the most finicky eater from the group asked for a second helping. Not only that guests were curious about the recipe as well for all of them being non-Bengalis have never had this type of kheer before. 1) Heat milk in a deep bottomed vessel and bring it to a boil, stirring continuously. 2) Lower the heat to medium and stirring continuously, continue heating the milk till it reduces to half in quantity. 3) Add condensed milk, cardamoms and sugar. Keep heating till the milk reduces to 1/3 in volume. 4) Turn off the heat and mix in the saffron. 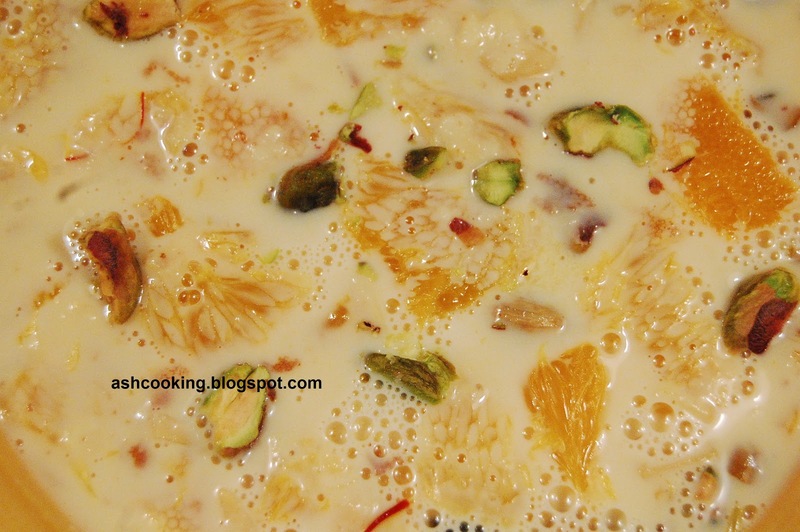 5) Peel the oranges, remove the flimsy membrane, chop the oranges into bite size pieces and when the milk or kheer drops down to room temperature toss the oranges in and mix. 6) Garnish with pistachios and almonds. Serve chilled.